September | 2014 | Love Those "Hands at Home"
The Squirrels and I . . .
We have our work cut out for us . . . I wrote quite a lot, early this year, about a quilt I was making as part of a challenge held by our quilt guild. As you will see, this quilt challenge clearly moved many people. The time and creativity and energy and passion that went into making these quilts was evident and inspiring. These quilts were made to honor our ancestors, our region, our home, our people. The quilts were made in response to a challenge set by our local guild to create a “Cot to Coffin” quilt, as a way of commemorating the men who fought in the Battle of Plattsburgh, in the War of 1812. The Battle of Plattsburgh took place in September of 1814 and was considered a turning point of the war. Local volunteers have been anticipating this bicentennial for a long time! To refresh your memories, the quilts were supposed to be made to measure 70 inches by 30 inches, with the idea that they could’ve been carried to battle with the foot soldiers. The quilts were a size that could be used as a blanket or, if the soldier should die, could be pressed into use as a burial shroud. We were asked to use fabrics, patterns, and techniques of the types available to women in early 1800s America. During the week of the Battle of Plattsburgh bicentennial, forty-two quilts were displayed in the City Hall. The quilts were made by women and men, experienced quilters and absolute novices! This quilt, made by a retired art teacher and the first quilt he has ever made, translates the portrait of naval leader Thomas Macdonough to fabric. 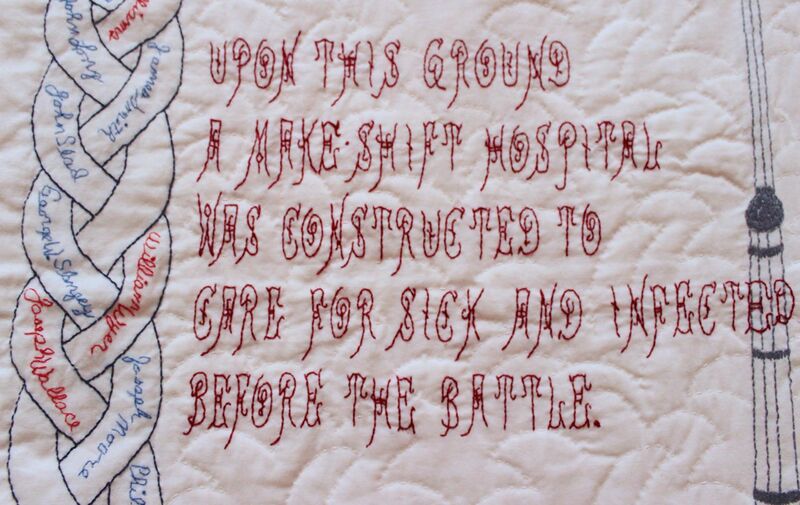 This quilt, made by a very experienced quilter, commemorates Crab Island, in Lake Champlain, the site of a field hospital during the battle and mass burial ground of both American and British casualties of the war. 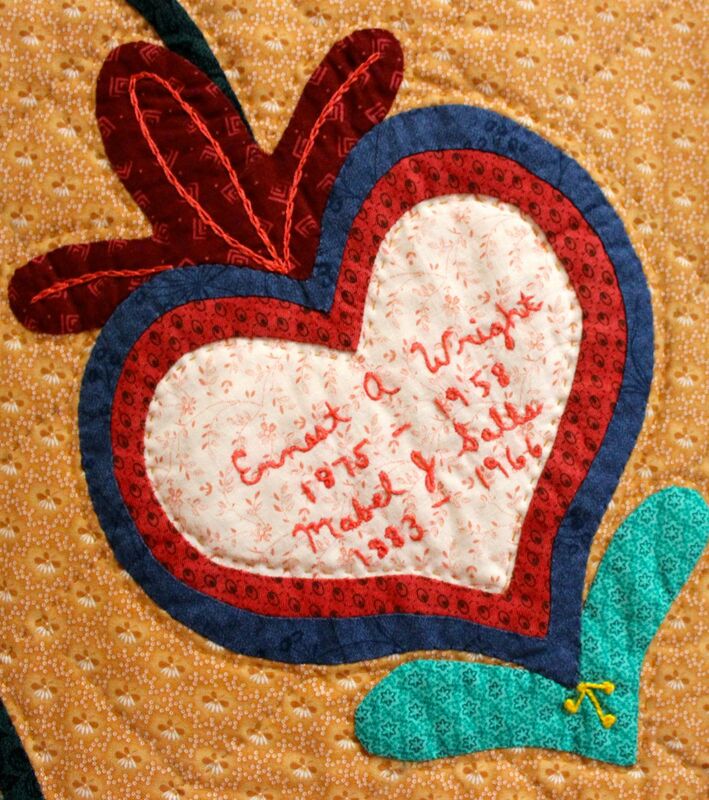 The quilter embroidered everything by hand, including the names of the men buried on Crab Island around the border. Other quilts used patchwork designs that were popular at the time and reproduction fabrics to recreate the look of quilts that could’ve gone to battle with husbands and brothers and sons. One quilt, instead of honoring the soldiers of the battle, honored the volunteers who have, for years, honored the soldiers of the battle. This quilt contains the signatures of the Battle of Plattsburgh volunteers who pulled out all stops to make the bicentennial a huge event! I especially loved this quilt, made by a cousin I don’t even know! It incorporates a stylized family tree design, honoring 200 years of the Wright family, the family of my maternal grandfather. I almost forgot to take a picture of my own quilt, which focused on a song written by Catherine Macomb, the wife of one of the leaders of the battle! I heard very kind feedback from people who viewed the quilt. The quilt was also pictured in the local newspaper, in a story about Catherine Macomb’s song! This was a new quilt-making experience for me, tying my work to a larger theme and purpose. I was, frankly, completely surprised at how much I was moved by the whole endeavor. It is so obvious, from viewing the quilts on display, that others were as inspired by the challenge as I was! O, Frabjous Day . . . In a previous post I said that, when we left the hubbub of Dublin, we sought quiet. And where better to find quiet than among the ancient folk and the marks they left on the land? Always drawn to graveyards of any age, we find the most ancient ritual burial places especially fascinating. Who were these peoples, who left symbols carved into gigantic stones? Who left passage tombs and dolmens and wedge tombs and stone circles? If I were going to urge people to visit just one place in Ireland in would be Brú na Bóinne, near Dublin in County Meath. This large and complex megalithic site is home to Newgrange and Knowth. 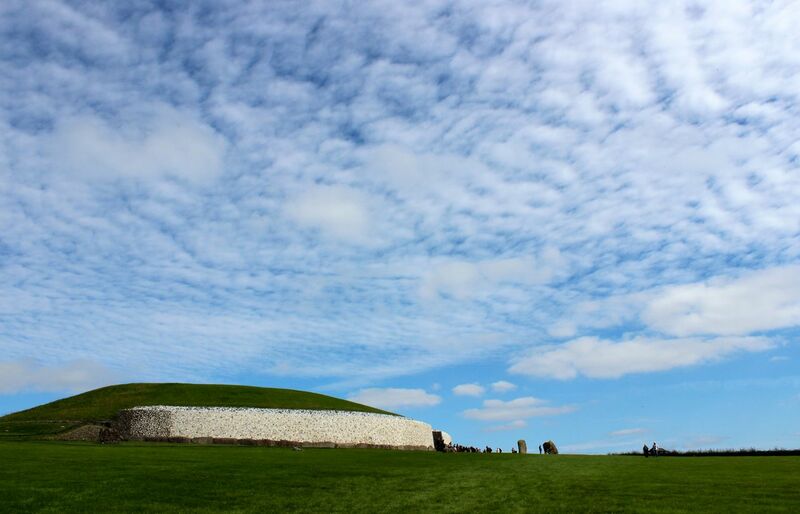 Here one finds passage tombs, ranging from small and modest to huge and awe-inspiring. These tombs date to 3500 BCE, older than Stonehenge, older than the Egyptian pyramids, older than most things we’ll ever be lucky enough to see. The majesty of these sites, with their evidence that we are only the latest of the innovative and reflective people to inhabit the earth, defies description. But they aren’t the only worthwhile megalithic places in the land. We also visited Carrowmore and the Cavan Burren Park. Carrowmore, in County Sligo, contains passage tombs, as well as stone circles, even older than Newgrange, dating to 3700 BCE. 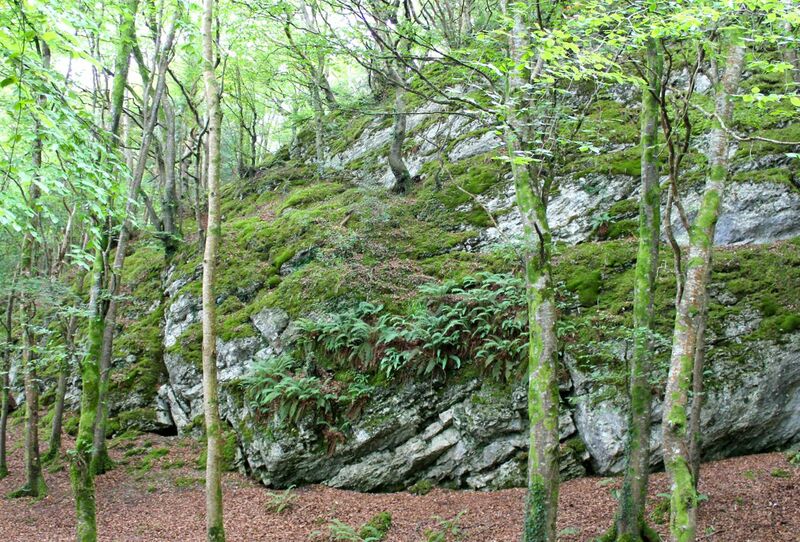 The Cavan Burren Park, in County Cavan, has a new visitor center and wonderfully constructed walking trails that take one past megalithic tombs, prehistoric stone walls, ancient rock art, and glacial erratics. Of course, a spot need not be ancient to inspire calm and introspection. From the National Museum of Ireland to Yeats’ grave, we found our quiet places. May you share the awe and peace we found at these remarkable places. A huge thank you to Angela, from A Silver Voice of Ireland, for her generous guidance in directing us to many of these wonderful sites! According to the folks at Foodimentary, it’s National White Chocolate Day! Do you have an opinion on white chocolate? Yay or nay? Would you ever choose it over dark or milk chocolate? This is also my sister’s birthday–she’s a dark chocolate kind of girl all the way! Oh, look—sheep! It must be Ireland! Yes, it was Ireland and, for newbie weavers, sheep mean wool and wool means weaving. One of our goals for this trip was to talk to weavers. 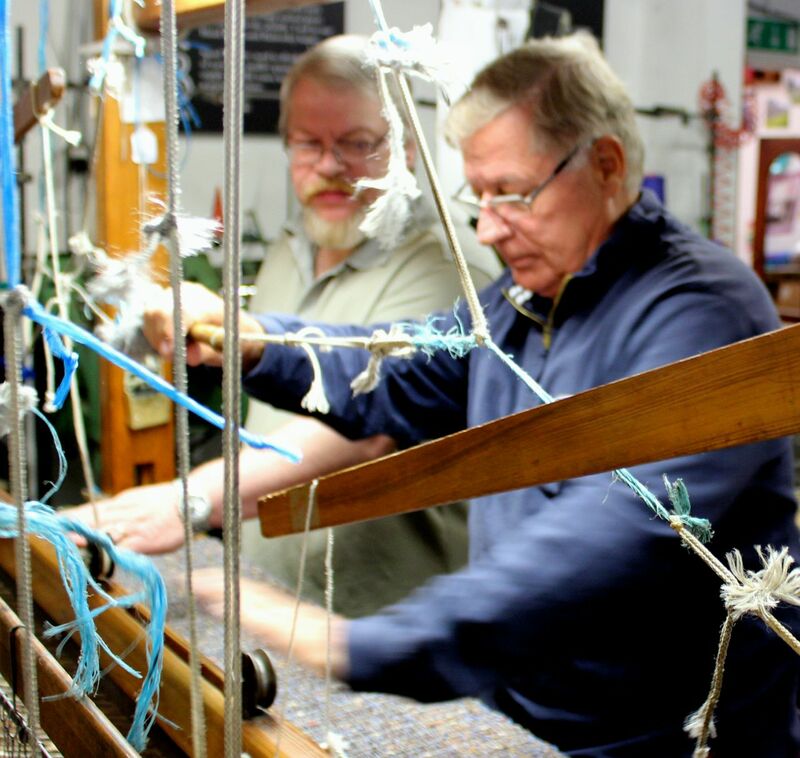 Hand weavers are still working in Ireland but not so easy to find. It seems many of the folks who know the trade are working these days to educate and entertain tourists, as was the case at Avoca Mills. The man we talked to at Avoca was certainly knowledgeable about weaving, and he talked as he wove. He even let a novice weaver take a turn! We had never understood what that meant because, when we weave, the shuttles move very slowly. But on this trip we were introduced to looms with flying shuttles—it makes hand weaving go so much faster! 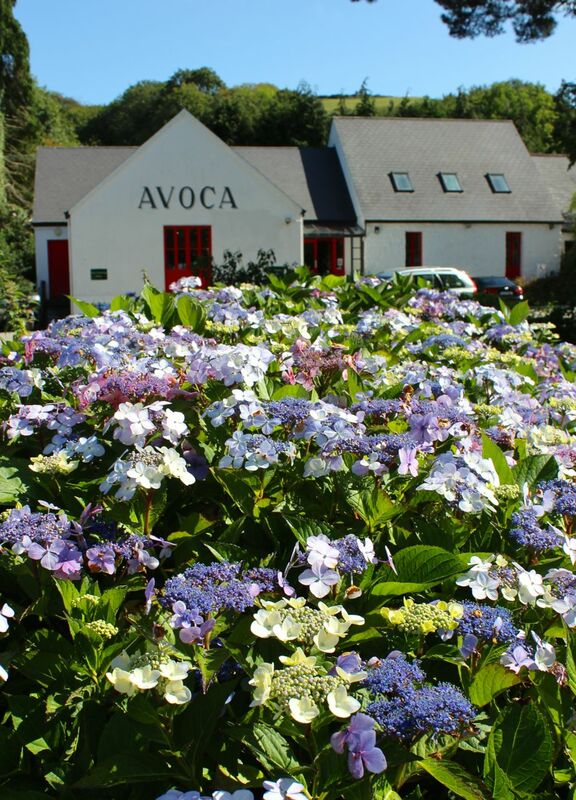 We also watched the production looms at Avoca, moving faster than the eye can see. And it was evident that, in spite of the presence of a hand weaver, much of the weaving coming out of this mill is done on mechanized and computerized machines. As much as we love old-fashioned handmade work, seeing the production looms, and even the flying shuttle looms, was a good reminder of a practical fact. We may have the luxury of doing this craft for creative purposes, but other people made their living at it, and still do. 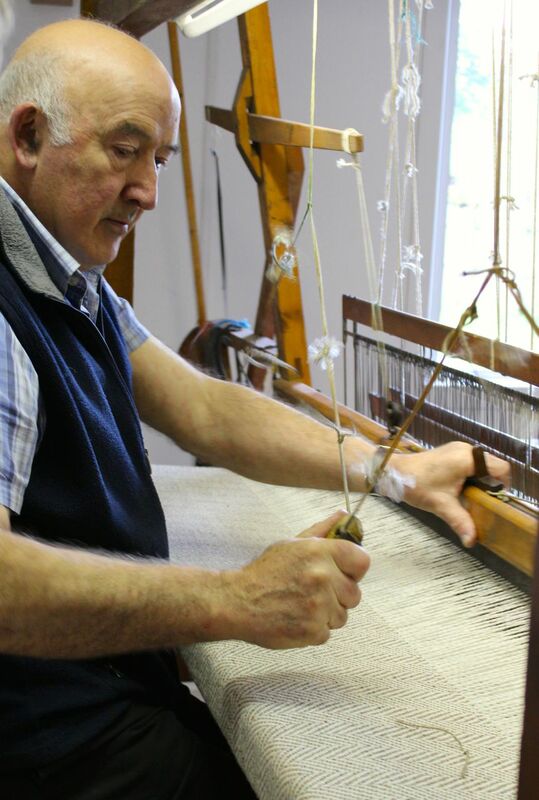 In fact, the one weaver we met who still does hand weaving exclusively, Eddie Doherty, in the town of Ardara in County Donegal, also owns the pub next door. When we rang his bell, he came from his pub to show us his weaving. He explained that, in the small towns in Ireland, one profession wasn’t enough to support a family. Years ago, as a young publican, he had needed a second source of income and had chosen weaving. That got us noticing other examples—Mannion’s Pub, next door to Mannion’s Butchers. King’s Pub, next to King’s Grocery. And our favorite—Kennedy’s Pub, next door to Kennedy’s Funeral Home! No question who supplied the gargle for those wakes! Watching these weavers inspired us. I particularly loved the ways color is used to transform relatively straightforward patterns into eye-dazzling beauty. We were sorely tempted by the beautiful things we saw. On previous trips we have done our best to support the handmade community, buying sweaters and woven blankets and tweed jackets. But this time we had come to Ireland with an agreement not to add to our wardrobes and linen closets. We had declared a shopping moratorium. But we couldn’t resist one thing—we bought yarn. 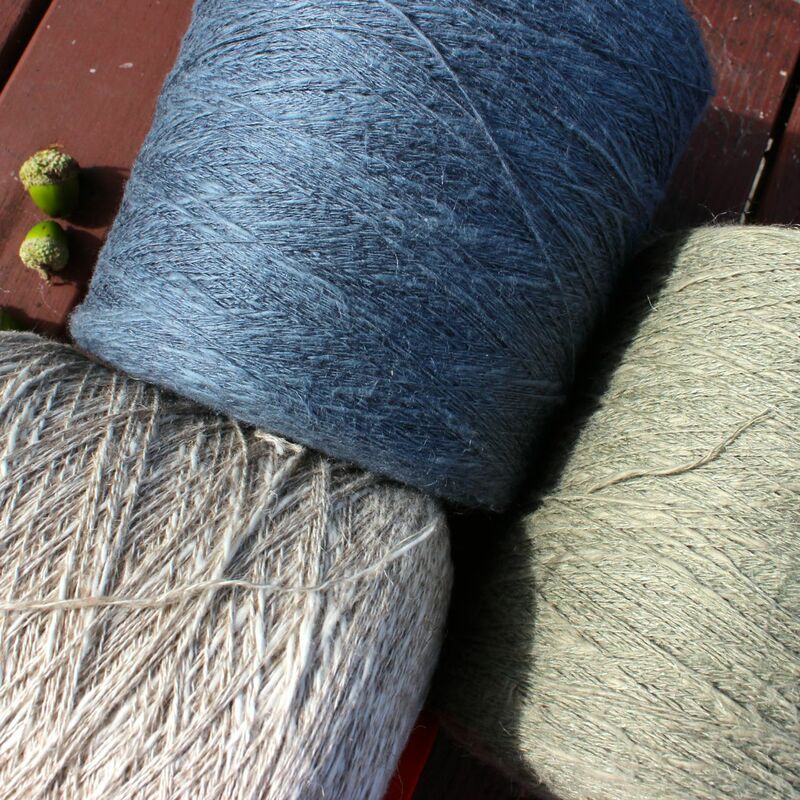 We couldn’t resist bringing home wool and cotton and linen, in the heathery colors of this lovely country. The plan is to use what we saw as inspiration, and to combine our Irish yarns with our own effort. We’ll make, at home, something to commemorate this particular trip to Ireland. We haven’t decided yet what form our souvenirs will take but we do know they’ll be one of a kind! I’ll keep you posted! In the meantime, more eye candy . . . I Will Arise and Go Now . . .
After the whirlwind that was our visit to Dublin for the Penn State football game, we were eager for a change. It was wonderful for a few days but we’re the quiet types, introverts, really. We needed an antidote to the noise and crowds and . . . well, the noise and crowds. We found it on the beaches and islands and hilltops. And we found it in Yeats country. I’m not knowledgeable about poetry. I don’t read much of it, and I understand less, but I do love what little I know by William Butler Yeats. When I was still working full time and living in a big city, I kept a framed copy of Yeats’ poem, “The Lake Isle of Innisfree,” in my room. I even have an old record of Yeats reading his poem! Now, we live year-round in the equivalent of Yeats’ “bee-loud glade” and I try, always, to consciously appreciate how lucky we are. So, as we drove through Sligo, I really, really wanted to visit this special isle. 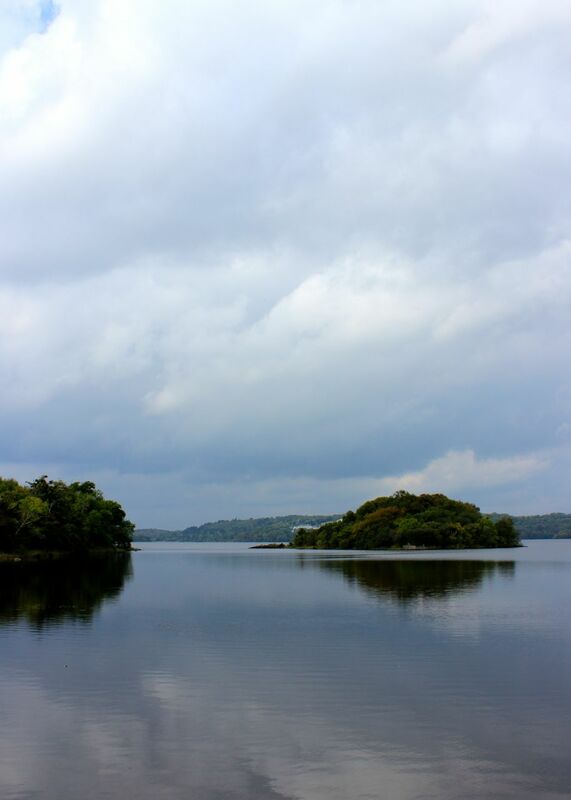 My long-suffering spouse acquiesced and we drove around Lough Gill. Then we drove down long, single-lane roads until we could see tiny Innisfree sitting just slightly off shore, tantalizingly close but inaccessible. We couldn’t get to it. We couldn’t walk on it. But, that’s okay—that very inaccessibility preserves the solitude and the mystery and the magic. 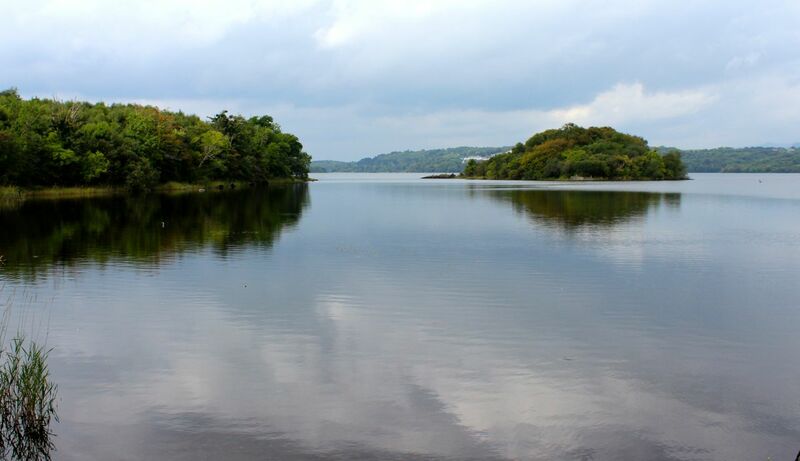 Just looking at Innisfree, with Yeats’ words sounding in my head, was enough. I felt it in my deep heart’s core. Where is your Innisfree? Here in the northern hemisphere, we’re preparing for winter. Yes, it’s only September and we still have weeks of splendid autumn to enjoy but we all know what’s coming after that. We see the inevitable signs. The geese are flying south, the squirrels are gathering acorns, the cats are finding patches of sun to in which to park and nap. We, the people, need to prepare, too; we can’t let winter catch us unawares. We’re putting the gardens to bed, doing outdoor chores, pulling out recipes for soups and slow-cooker meals. 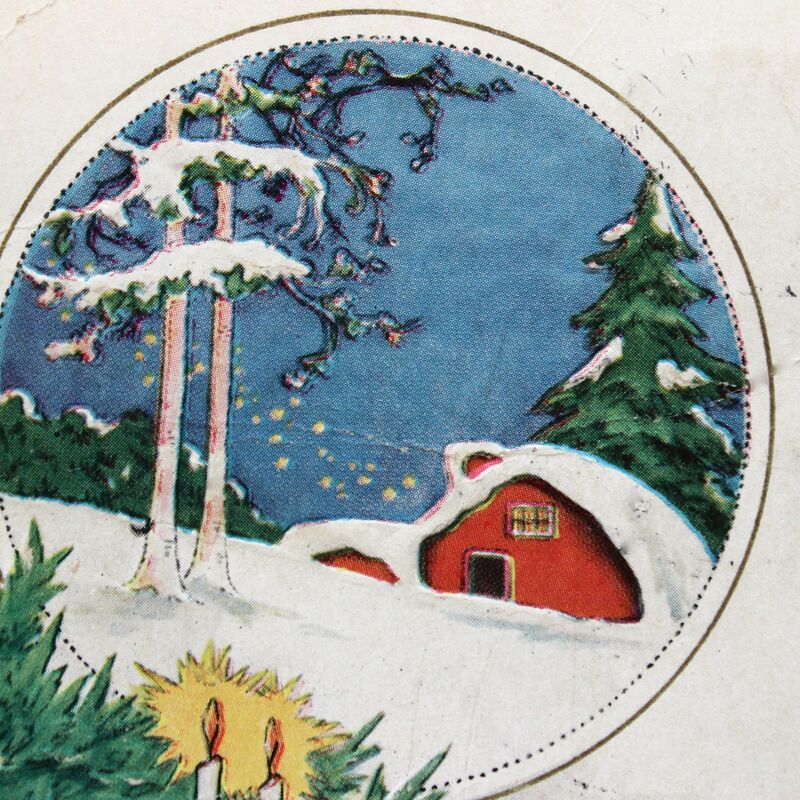 Winter is the time for hunkering down, for working indoors, for getting in touch with the heart of the home again, for making our own warmth to sustain us. Here, at out house in upstate New York, the warmth comes from the kitchen, the loom, the quilt frame. I need to be ready. I’m lining up projects and feathering my nest. I’m doing the chores that will ensure a happy, productive winter. I’ve spent a lot of time this past week assessing my readiness for candy season. As you may recall, I make and sell chocolates between October and May, so I have been gathering ingredients, deciding how much chocolate I need to buy, and finding the pans and bowls and spatulas I put away months ago. I finally located the candy thermometer and today will look for the candy boxes and labels I stored, to see if I need to order more. I don’t particularly enjoy all this organizing and planning—I like making the candy! But I need to do these chores so I’m ready for the fun part. I’ve also been making decisions about a weaving project. I don’t want to stop weaving but, right now, I don’t have the time or inclination to start anything challenging or fancy or artsy. I’ll leave that kind of weaving to my husband; I’m going to make some dishtowels. Some nice dishtowels, in a cotton and linen blend, off-white, with a red stripe down the sides, just like the vintage towels I love so much! Once I get the loom set up, I can weave a few inches whenever I please and watch the fabric grow like magic. I don’t particularly enjoy all this measuring and planning—I like weaving! But I need to do these chores so I’m ready for the fun part. My other preparation for winter involves quilting. I haven’t done any quilt-related work since I finished the 1812 quilt, and I miss it. Winter is the perfect time to do hand quilting because it means settling yourself beneath the quilt, while you stitch, warm in your cocoon. As you know, I love college football and will watch any team play, any time. I want to get a quilt top basted and ready to quilt so I can work on it while I watch football. As it happens, I have quilt tops made by my grandmother’s aunt and by my husband’s grandmother, beautiful hand-pieced vintage tops, just waiting for me to finish them. I’ve picked one and will buy backing fabric this week. I don’t particularly enjoy all this basting and planning—I like quilting! But I need to do these chores so I’m ready for the fun part. The chores need to be done so, during winter, we can be secure and productive and content as the cold winds whip the snow into drifts around us. How do you prepare for a comfy, cozy winter? Have you begun your chores?